Long ago, I wrote the first draft of My Soul to Keep. It was a fantasy with dragons. What was I thinking? My next draft or two or three were just as far afield as the fantasy, though they were closer to a science fictional approach. Then, after many discussions with my husband and friends, I came up with the alternate world in which the story now takes place. I thought readers might enjoy a look back at some of the outtakes from those earlier drafts. So, without further ado, here’s an outtake: an early prelude to My Soul to Keep. 1. Now it came to pass, in the days after the Great War, that the children of the world did evil in the sight of the Lord. 2. And the anger of the Lord was kindled against the people and He delivered them into the days of darkness called the Great Depression. He overthrew the tables of their moneymakers and money changers; and gold became as water. 3. Thieves, drunkards, and murderers ruled the land known as America. The American leader, Franklin Delano Roosevelt, was assassinated; yet the people of America repented not. 4. And in these days the peoples of Europe, Russia, and Asia loved God not. So it came to pass that there was war between Britain and the Third Reich. 5. And the wicked fell upon each other and they dwelt in the darkness of their damnation. 6. Ten times ten thousand Britons were slain in the fields and in their homes. Their cities were destroyed, and their young men carried away into slavery. 8. So it came to pass that the American people closed their ears and would not hear the strife across the sea. For they were sore afraid. 9. Now there arose many prophets: Father Charles Coughlin, Gerald L. K. Smith, Francis Townsend, Aimee Semple McPherson, and William Ashley Sunday. 10. But the greatest of these was born of the land called Virginia, in the Blue Ridge Mountains, a man named Samuel Garret. He was a humble and pious man whose heart was troubled by the wickedness of his people. 11. There was sent to him from God the angel, Gabriel. And Gabriel said unto him, “Rise up and walk through the length and breadth of the land.” And he did. 14. “Open your ears that you may hear the word of God unto you: Woe be unto this wicked and faithless generation. In as much as ye shall repent, I will cleanse you of your iniquities. 16. And it came to pass that Samuel made the people naked to their shame. And when the people heard the words of the Lord in their synagogues, and in their temples, and in their kingdom halls, and in their churches they fell down upon their faces and begged His forgiveness. 17. So the Lord blessed the people who took Fellowship with Him. And remembering His covenant with Noah, God sent not the waters but the angels, the Azrael, to cleanse the wicked from the face of the land. I hope you enjoyed this glimpse into the past. If you haven’t read My Soul to Keep this passage is not in the published book. The information contained in this outtake, an early prelude, still formed the background for the story world. Click on this link to learn more about the book. If you have ready My Soul to Keep, what do you think of this? You know, the warped Christianity, fire-and-brimstone approach still goes pretty well with the version of the book that’s published, even if the specific details don’t. Fun to get a glimpse of what didn’t make it in! I hope the next book is coming along well. Thanks, Jennette. The WIP is coming along. 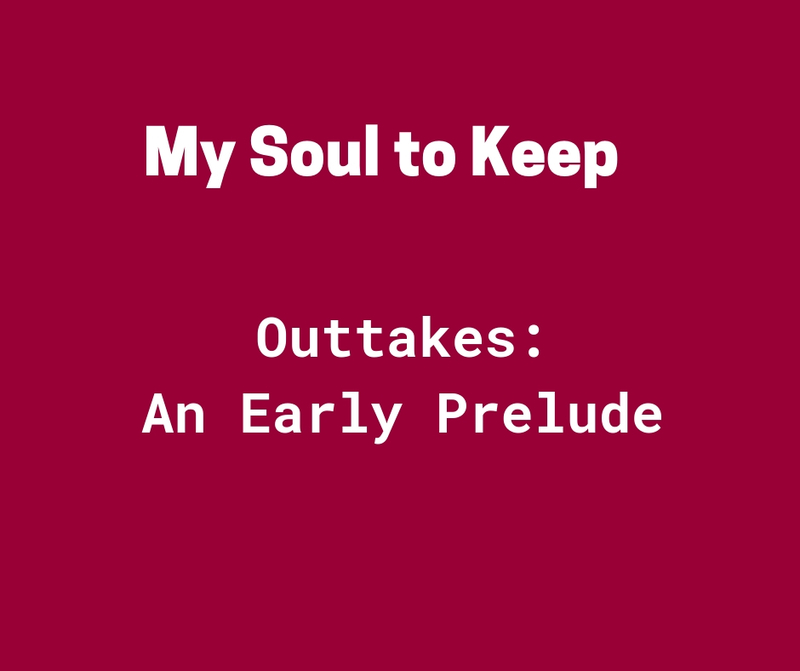 The next in the My Soul to Keep series is still in development (how’s that for a euphemism!) Thanks for asking! I love the creativity of your writing in this bit. Thank you, Lisa. It felt a little wicked to write it, but that was fun.